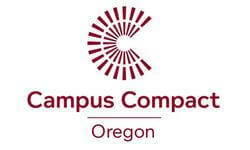 Campus Compact of Oregon convenes and supports the work of educational institutions individually and collectively to improve their practice around institutional equity, collaborative learning, and community engagement to respond effectively to a racially diverse and changing Oregon. Campus Compact supports college campuses, K12 schools, and education nonprofits to engage college students in service and civic engagement in ways that address educational inequities and work to dismantle the systemic causes of those inequities. Through national service programs, faculty and administrator development, presidential convening, student leadership development, and service programming we build our collective capacity to work together on creating a more equitable system of education in Oregon. Direct programming impact may include increased access to information and supports for college application, scholarships, success, and graduation; Increased capacity to implement community-engaged learning opportunities; and deeper analysis and interventions to address systemic barriers to racial justice and equity.